Rain day! Our tractors get to take a break when it rains, but our field crews harvest for you rain or shine! And…they harvested some pretty wonderful crops today, including sweet corn! It’s the first harvest from our first planting. We have four total plantings, so you will be seeing corn in your shares many times this season! SHHHH!!!!! You’re getting the very first harvest of Sweet Corn this season! Remove the husks and silks, boil a pot of water and drop in the ears when it comes to a boil. I have found that you can turn off the flame at this point and put a top on for about 3-5 minutes. At that point they should be perfectly cooked! It’s also worth mentioning that there may be an earworm in the tip. This is proof that our corn is unsprayed, organic and non-GMO! Just cut off the very top with a knife and the rest of the ear should be good to go. In the event that you receive an ear that has been damaged by the worm, just let us know and we’ll get you a replacement next week. Enjoy! Storage: Don’t store it — eat it tonight! If you need to store it, keep it in an airtight (plastic) bag in the refrigerator. Uses: Cooked. When to use: Within 2 days. Red Long Onions – Like I said last week…Another week, another fresh gourmet onion! These red long onions are particularly nice in salads. I’ve been eating them in my batavian lettuce salads with homemade croutons and sliced cucumbers. Yum! Carrots – Sweet, crunchy and delicious! Storage: Separate the greens from the roots before storing in an airtight (plastic) bag in the refrigerator. Uses: Raw or cooked. When to use: Within 5 days. Red Batavian Lettuce – This wonderful variety of lettuce grows pretty well in the heat of the summer. It is sturdy and crunchy like Romaine, but it has a slightly softer leaf texture. It’s my favorite lettuce variety of all! Storage: In an airtight (plastic) bag in the refrigerator. Uses: Raw. When to use: Within a week. Cucumbers – Cucumbers are high in alkaline magnesium, calcium and vitamin K1. So they’re not only delicious, but super healthy too! Zucchini/Summer Squash – Zucchini plants produce zucchini day after day for 5-6 weeks. The fruit grows very quickly, so we harvest it daily. You’ll notice that you’re receiving lots of zucchini in your shares this season. This is why! It will wind down soon and we have one more planting that we expect to start harvesting in about 3 weeks. Garlic – Our hard-neck garlic is like gold. The garlic seed is super expensive and difficult to source in quantity, so we don’t grow too much of it. The fruit shares from Briermere Farm continue! • The fruit shares are packed in bulk in plastic crates. If you have paid for the fruit share add-on, it will say “FRUIT” next to your name on the check-in list. The farm will send only the exact number of fruit shares for those who have this add-on. There are no extras. Fruit Share members may take one bag of fruit per paid fruit share. 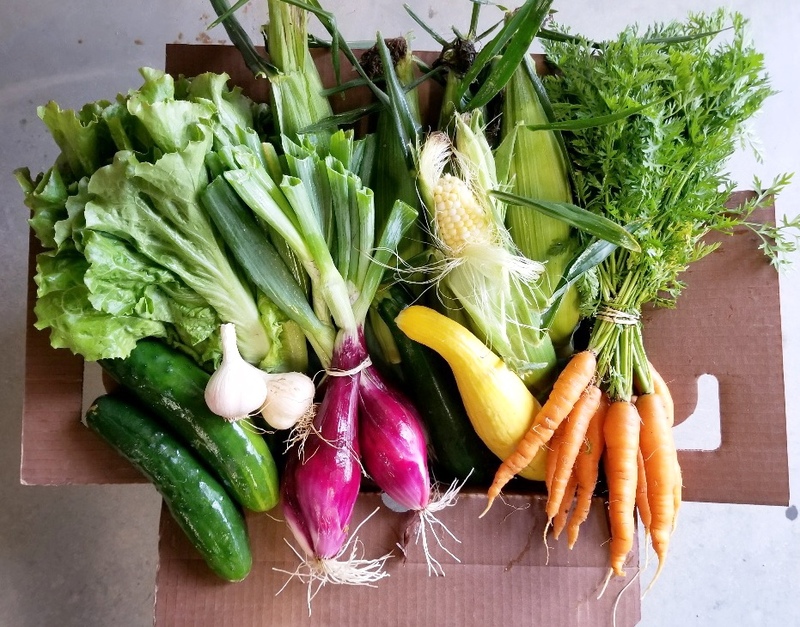 GEOF provides us with extra vegetables to seed our swap box every week. If there’s something in your share that you don’t wish to have, you can trade it for something inside our swap box. If you don’t like your swap options, then you can simply donate your unwanted item to the swap box, or take that item home with you. Please note swaps are to only occur with items inside the swap box and your own share. Only items in their full quantity may be swapped. For example, if the CSA share includes 5 carrots, and you decide to swap your carrots, you MUST swap all 5 carrots. Please be considerate of other members and try to limit your swap to one item per week.